Laolu Senbanjo is a lawyer, a visual mastermind, and now, he is an AIDS activist. After he left his career as a human rights attorney, Laolu pursued another passion: art. 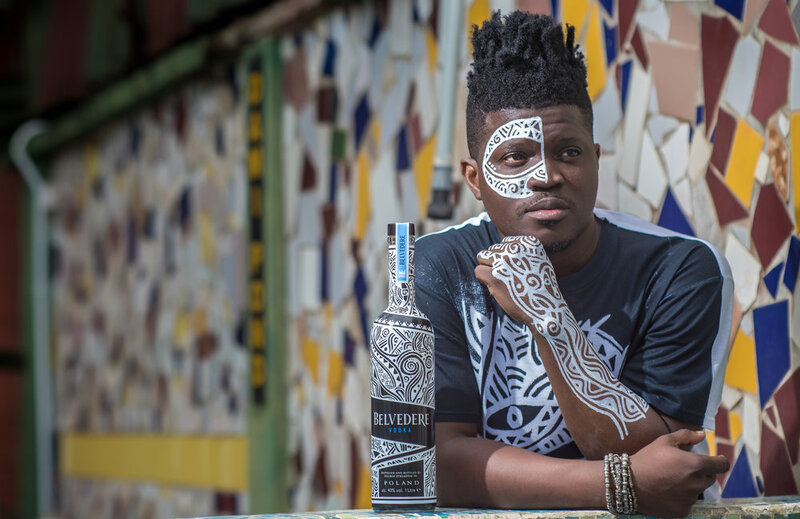 Now the Nigerian, Brooklyn-based performance and visual artist is not only award-winning, but the designer of this year’s limited edition Belvedere Vodka bottle for (RED). Laolu’s main artistic medium is the skin. You might recognize his signature body-paining that was featured in Beyoncé's Grammy Award-winning visual album, "Lemonade." From the cover of the Washington Post to collaborations with Alicia Keys, Laolu’s eye-popping works weave in the vibrance of his home country and story-rich designs, drawn heavily from his Yoruba heritage. The first Belvedere bottle with high-quality full-wrap sleeve technology features a flowing design with sharp edges that represent the water and rye working together to produce dimension and taste. Subtle skin-sense texture, which reacts to UV lights, is used to bring another sensory component to the bottle. The charcoal coloring and distinct shapes create complex, story-rich designs, which draw heavily from his Yoruba heritage. By partnering with Belvedere and (RED), Laolu was able to fuse together his two passions — art and activism — for good. "As an artist I get to share my soul with people around me, my environment and the world and I'm able to channel my experiences like my journey as a human rights attorney and as a Nigerian," said Laolu Senbanjo. "The Belvedere bottle design came from that inspiration as well as doing a lot of research about what Belvedere is at its core, like the rye and the pristine water. The bottle is an amazing blend of my art and bringing to life what Belvedere stands for – and I get to be a part of giving back to society, which means a lot to me."